And thus, the preschool world culture unit was born. 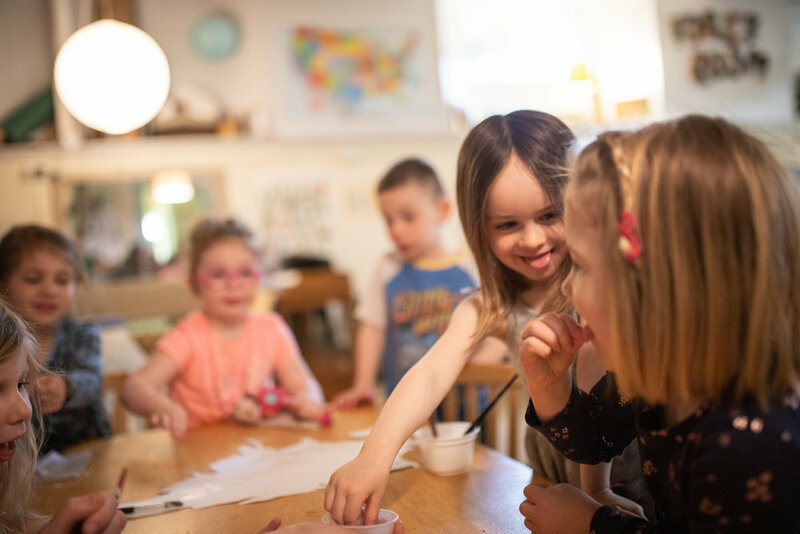 Because our Early Childhood program is Reggio Emilia inspired, following and honoring children’s inherent interests and desires drives our curriculum. The following shows the journey of preschoolers learning about the world through pictures and stories, art projects, special talks, using senses, reading books and learning songs. One of the first projects the children worked on together was a topographical map of the world with their learning buddies. Preschool and 3/4 students collaborated on a 4x4 foot panel. Using only recycled materials, loose parts and paint, children designed and implemented a beautiful replica of our world that is now hanging in the preschool hallway. Seeing it in person is the best way to experience it. Tess, a teacher in the preschool Forest Room remembers the work they did together. This collaborative project sparked curiosity in learning more about children in different parts of the world. What better way to learn about a child than to ask about their favorite toy? Preschool teachers printed off several pictures of children posing with their favorite toys from around the world. Breakwater children also posed with their favorite toys and a map was created in the preschool center room for display. The children reference it frequently when they want to understand more about a specific country and the children who live there. You can see some of the pictures here by photographer Gabriele Galimberti. “When we started with the photos of kids with their favorite toys from around the world I loved how the first thing that was often commented on was their environment and not necessarily the toys the children in the picture had. “The walls are made of mud!” remarked one child. “The refrigerator is blue!” said another. Preschool students dove even deeper into learning about maps and cultures from different parts of the world by making their own sensory spice map They used spices that hailed from different regions and glued them in their respective places on the map. The preschool classroom was an olfactory wonderland that day with scents of turmeric, cloves, cinnamon and cardamom. Some students even conjured up enough courage to sample even some of the more obscure spices. In the picture below, preschoolers look on while one of their friends samples some pink Himalayan sea salt. The map will be finished shortly and will hang in the front foyer of the brick building. Be sure to stop by to see (and smell!) their beautiful work. Then came the flag designing and creating. Preschool students, using felt, markers and wooden dowels designed flags to represent themselves. Once the flags were finished, students wrote an original flag parade song and paraded their flags singing their song through the halls of the brick building. Our preschool students have even gotten to invite guest parent speakers into their classroom to learn about different cultures. One of the most engaging ways to learn about the world is through our richly diverse parent community. We had several parents join us to talk about places they have lived in the world. The children were able to sample foods, look at photographs, learn words in different languages and ask lots of questions. Thank you to Chris who came to speak about Japan! Some highlights from his visit are in the video below. Thank you also to Noemi and Bulscu who shared about their homeland of Hungary, Arunima who plans to join us to discuss India, and Kakra who will soon share about growing up in Ghana. As a bonus, our Spanish teacher Señor J. came to answer questions about Mexico and make tortillas! We feel so lucky to be able to learn about so many places from people in our very own community! The study of world cultures in early childhood provides young children with an opportunity to explore the larger world. The toddler and preschool program has recently been inviting parents into the classrooms to integrate rich exploration and learning moments about different cultures of the world they have seen and/or traveled too. Such rich, integrated explorations celebrate diversity in our community, introduces children to the physical world around them, and expands the minds and hearts of our youngest learners. 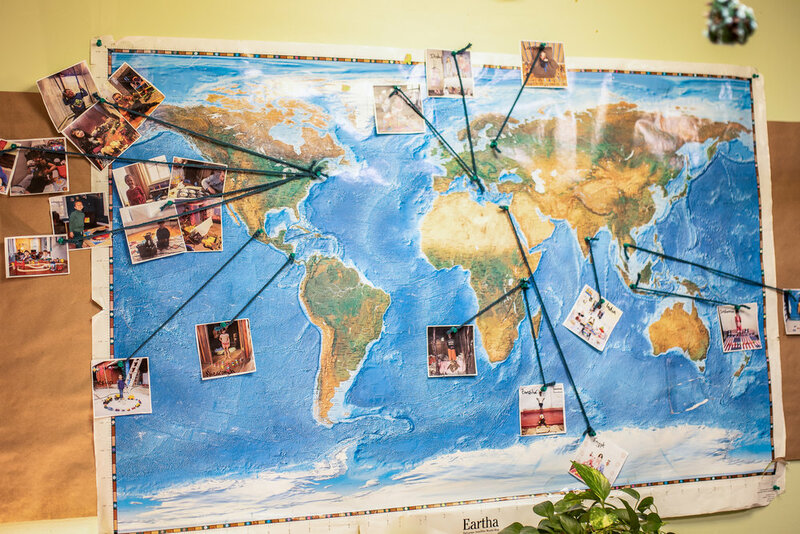 As we head farther into spring, we can’t wait to see what else our preschool students learn about cultures from around the world and where their curiosities take them next!